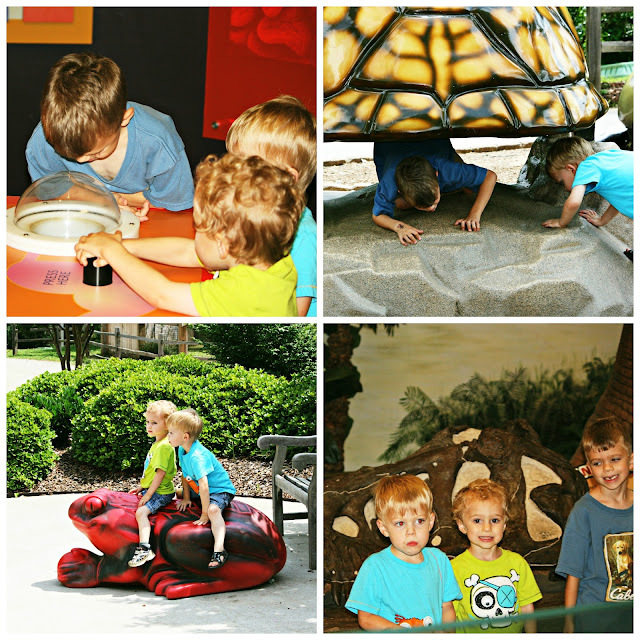 Last week the boys and I took a day trip to the Greensboro Science Center, where we met Pam and George (my aunt and uncle) for a day of fun. I took too many pictures. There were a few scary moments. 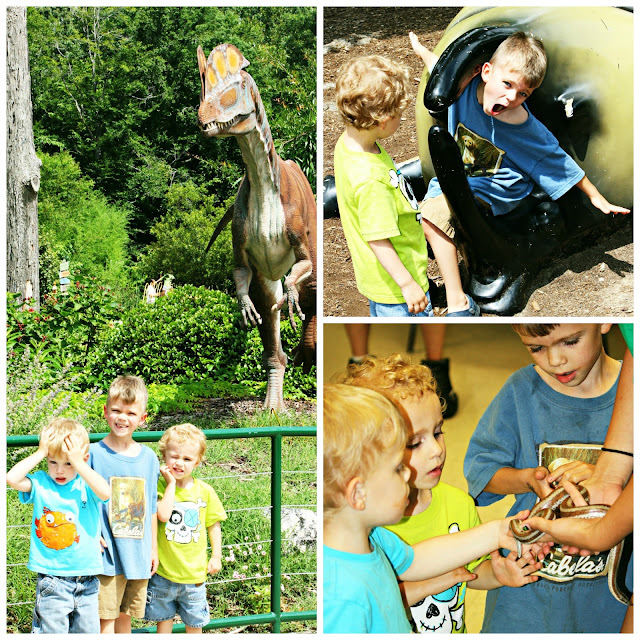 We had to watch out for dinosaurs, giant beetles, and snakes. There was plenty of wildlife to be observed. The boys especially enjoyed brushing the goats, who were remarkably subdued. I thought the one the twins were brushing was a pregnant female. Oh did 'she' ever have a big belly. Triplets for sure! And then I was informed that all the goats were male. Whoops, my bad! Cort enjoyed petting India the rat. And we saw a rather strange snapping turtle. By far, one of the biggest attractions was the vomit machine seen in the upper left corner of the collage below. They pushed a button and foul brown liquid came squirting up. 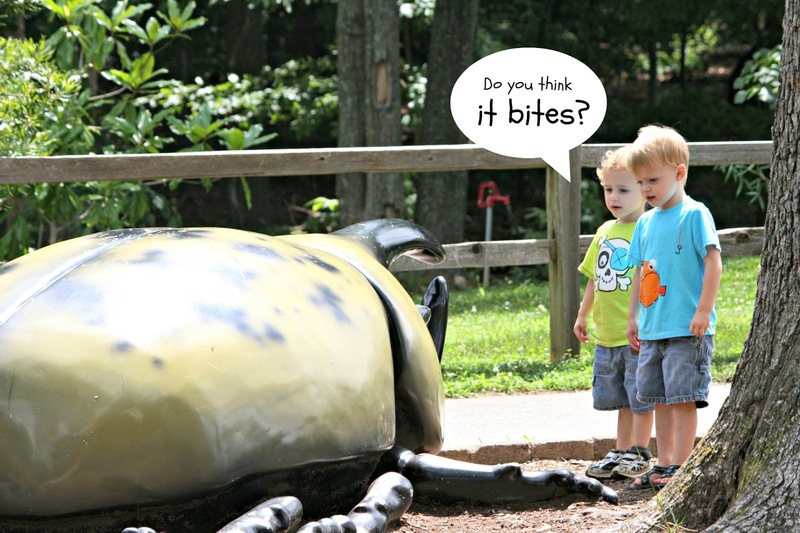 It was SO gross and my boys were engrossed. I didn't think I'd ever pull them away from the awe of the vomit machine. We were there just a few days before the grand opening of their new aquarium, so we hope to make a return trip sometime soon. 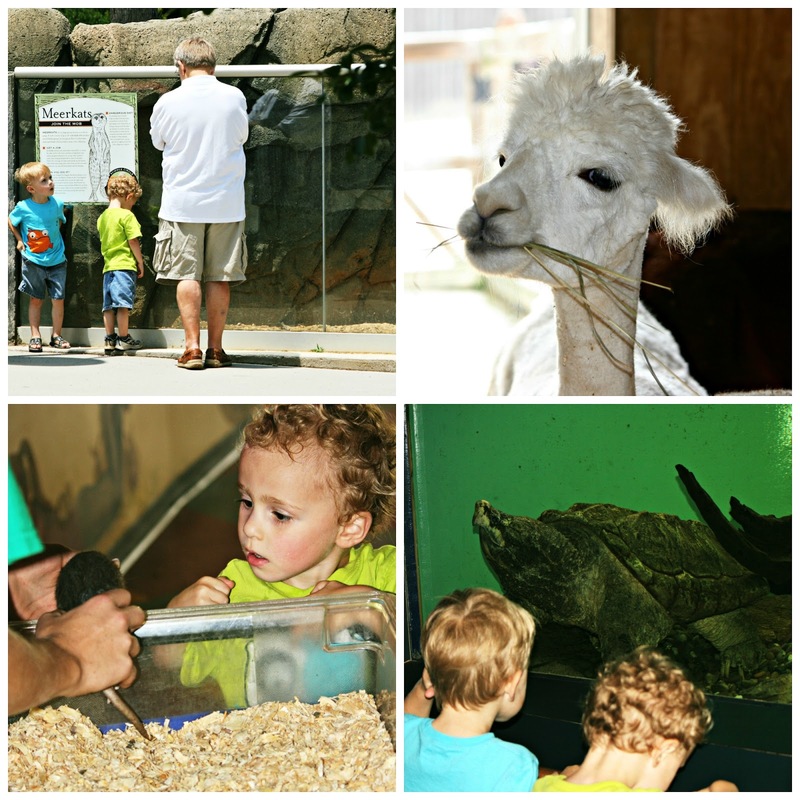 The entire place was marvelously hands on and I was impressed by how helpful the staff was and how generous they were in allowing the boys to interact and touch the animals. If you're in the Greensboro area, I'd highly recommend it (whether you're a kid or not!). No wonder they enjoyed it so! And why am I not surprised that boys loved the vomit machine? Ha! Nasty! JDaniel would love the vomit machine! This really looks like a wonderful place to explore. What a fantastic day for you and the boys! I can see the delight in their faces. Typical boys...loving the vomit machine. hehe! Neat place to take the kids! That snapper is an alligator snapping turtle IIRC. A vomit machine...well that is new for me :-) But, I bet my kids would have loved it too! What a great place! I used to love taking my kids to places like this. Enjoy their young years, they grow so fast! Science is better learned as a hands on experience. A vomit machine! That is total boy heaven. What a fun trip--and I'd have made the same error about the goats. 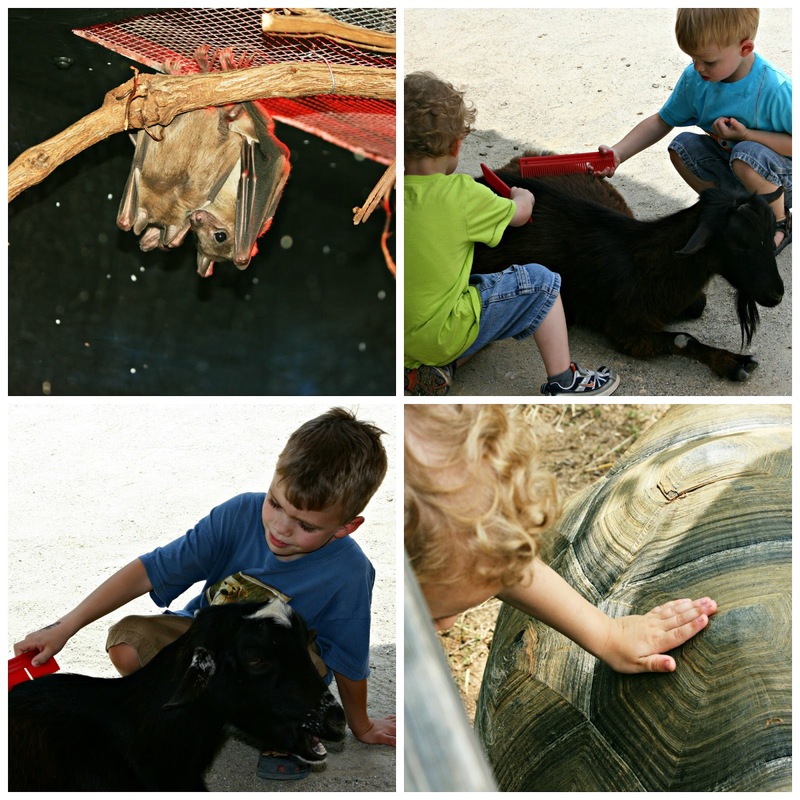 What fun to interact with animals like that! But the vomit machine? Gack! Lol. This looks like the best place ever for kids!!!! And I love the hands on the head post! The giant beetle is totally creepy, and the bat looks like a live on they keep in a cage? I am imagining this is too far away for us to go, but I would if it was closer. What will you be ding for the fourth?whatever it is, you always have a lot of fun!! wow seems like a real good fun day. Its true that few things are learnt better when you see them. Green vomit machine. My prayers are answered. Ha! these are all so great pictures. what a nice place to get the kids! How cool! Love all the photos, especially them with the goats. So neat! It looks like everyone had a great time! What an awesome place, and so educational. You are funny, a vomit machine, I had all kinds of inventions in mind before I saw it. Now that looks like a really fun day. I'm not sure about the vomit thingy but I'm sure it thrills the kids! Love all you pictures. Looks like a wonderful place for little boys to visit - a vomit machine, snakes, turtles, goats - what more could they ask for! You sure take those sweet boys to not only fun but educational spots. Great set of photos and it looks like everyone had a good time. Happy 4th of July. God Bless America. I have really got to take my grandsons. I am sure they will enjoy checking out the animals and that vomit machine. You sure did get some great photos. LOL... that is funny that the best thing for them was a vomit maching. Boys will be boys. Looks like fun! Great pictures of the boys...they're getting so big!! I love places like this! I wish Omaha had one. The closest science museum is in Kansas City. It looks like your boys had fun! Looks like ya'll had fun! You were in our neck of the woods.